There are also a bunch of new coupons on Coupon Network as well. 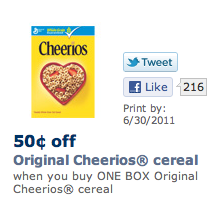 These General Mills coupons are great because they don’t have the “Do Not Double” on them. So, if your store gives you a hard time about DND coupons, then it’s best to get them from Coupon Network. Today’s Daily Deals – ShoeMart, SwimSpot, Tikkr & More!